Description: (from Goodreads) Love is all you need...or is it? Penny's about to find out in this wonderful debut. April's Thoughts: I actually really enjoyed this. It is a really cute story. Although I did feel that the main premise of the story was something that I had seen before. Penny had been wronged by a guy and decided it was time to be done for them, at least for a while. Then she notices that she is getting a lot of attention from other guys. But, the overall story and the way that it is done, works. It is an empowering story. I'm sure many girls no matter the age have felt like when a friend is in a relationship they tend to lose time with them. 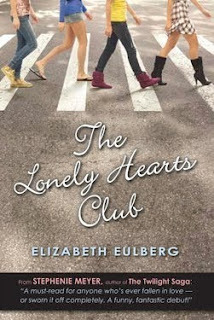 The Lonely Hearts Club shows girls coming together to be there for each other and grow as friends and not lose their own identity. This is a story that I see myself reading again. I also look forward to seeing what else Eulberg has coming in the future. I can't help but think: I kinda wish this book was around for me to read when I was in high school.